I stare into the eye of the manta ray as it cruises past me – just centimetres from my face – on great black wings, three metres wide. “They come into the bay at high tide,” he explains. The challenge for Stevens is that local hotels and the so-called “safari boats” that carry scuba divers around the Maldives have also discovered the secret of Hanifaru. 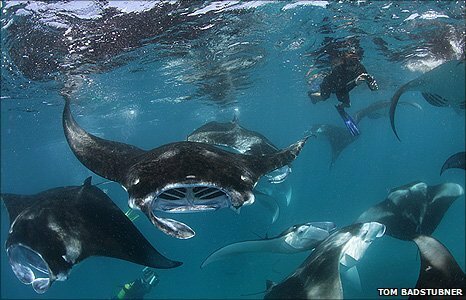 “The government has declared the bay a protected area,” says Stevens, “but we need a patrol boat or a ranger to monitor just how many people can swim with the mantas at any one time. The manta’s life cycle is more like that of a mammal than a fish. “Growing coral like this may be the future for protecting our shoreline from the sea – a kind of bio-engineering more effective than concrete and steel barriers,” said Nasheed. “The marine world is a beautiful attraction for tourists, but remember it’s where almost all of our food comes from. What was unusual was that the cabinet convened underwater – wearing scuba gear. With nowhere in the Maldives more than 2m (6.5ft) above sea-level, the threat from climate change is very real. 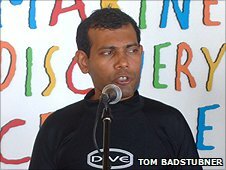 Nasheed’s decision to protect the manta rays of Hanifaru is also a matter of economics. For now, they are safe – if a little crowded – and they will be safer still if funding can be found for that patrol boat at Hanifaru. Posted on March 9, 2011, in Uncategorized. Bookmark the permalink. Leave a comment.